Forget wasting time on writing training plans for your clients. You can now create plans through the Workout Editor, send the plans to your clients' phone and track their progress. Forget about using Spreadsheets or papers for your Training Plans. 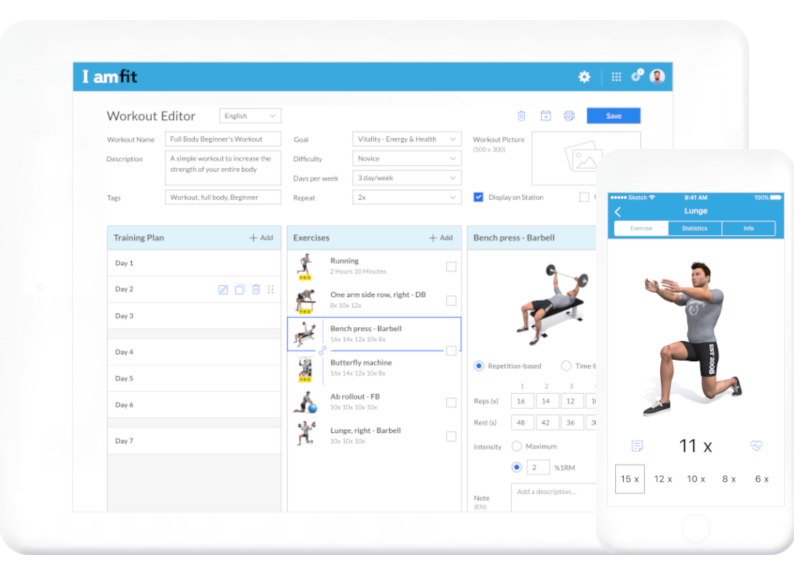 With our Workout Editor, you can create digital plans by choosing over 4,500 3D exercises and send them to your clients' smartphone. Additionally, you can duplicate training plans in order to save lots of time for the creation of new plans. Personal Training clients do not simply want to see physical improvement nowadays, they want facts. Show them their progress with this feature, which displays their achievements with you in details. Discover all the Training features that will facilitate your clients' Training. Create and assign professional training plans in minutes with our drag-and-drop editor. Save time by duplicating plans for similar clients. Virtuagym contains an ever-growing database with 4500+ 3D-animated activities. From independent trainers to studios to big box gym chains: our workout editor is the right fit. Keep an eye on client progress through hundreds of available metrics, and spot their trends at a glance. Training plans are available on any computer, your branded fitness app, or branded print-outs. We'll keep adding exercises and new features, to make sure that our software works for you.